The devastating earthquakes that struck Armenia on Dec. 7, 1988 — a 6.9-magnitude quake and a 5.8-magnitude tremor, hitting just minutes apart — killed more than 60,000 people and destroyed nearly half a million homes. They also struck at a time of political unrest as Armenians were increasingly at odds with their Soviet overseers as the Cold War was nearing its end, and the Soviet Union was grappling with its imminent demise. As a stopgap, the Soviets used empty shipping containers to house many of the 500,000 Armenians left homeless by the quake. But the Soviet empire soon collapsed — along with Russia’s interest in helping the Armenian families living in the “temporary” shipping container shelters, better known as “domiks” in the again-independent country. 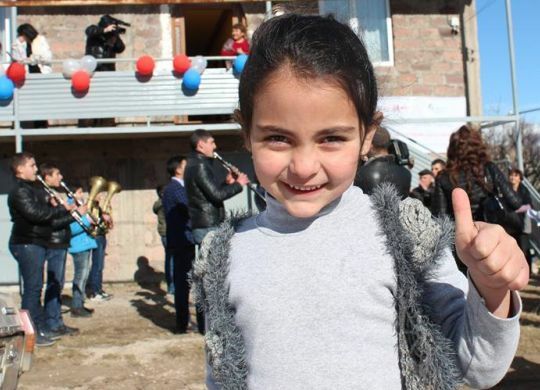 Helping those families still living in domiks more than a quarter-century after the quake has been a primary concern of The Fuller Center for Housing’s building partners in Armenia. They have helped more than 500 families build simple, decent homes. More than a fifth of those homes — 135 across 10 provinces to be exact — have been the result of a partnership with VivaCell-MTS, the leading communications provider in Armenia. The latest family to celebrate having a new home is the Sukiasyan family in the town of Stepanavan in Lori province. As with most home dedications in Armenia, it was a joyous, colorful affair. PanArmenian.net reports on this latest home dedication at the link below. Also, be sure to check out the following slideshow for scenes from the event.